Colin Moore enjoyed a glittering career at both ends of the state. A fast and skilful midfielder/half forward, Moore’s career was littered with personal achievements and accomplishments. Moore first played senior football with North Hobart in the TANFL in 1952, having started out – as many other North Hobart greats have – at Campbell Street Primary School. By his second season he had cemented himself as a regular member of the Redlegs’ side, taking out the senior Best and Fairest award, with a second award coming two years later in 1955. By 1954 Moore’s standing had risen to the point where he was awarded the Weller Arnold Medal as the TANFL’s best representative player. He was subsequently selected to represent his state and two years later appeared in the first of three national carnivals at the 1956 edition in Perth. 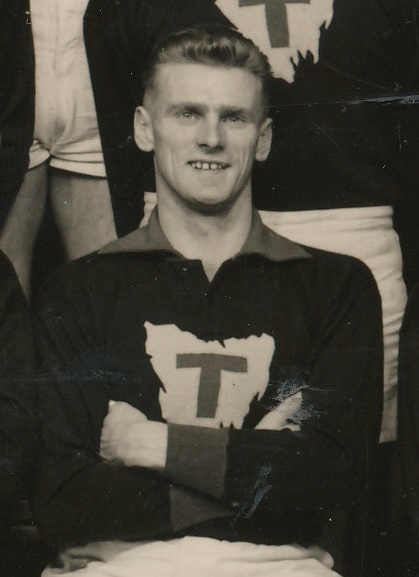 1956 was Moore’s last season in Hobart for a number of years as the following season he was appointed captain-coach of NWFU side Penguin. His stay at the club totalled five seasons and Moore relinquished the coaching role after the first, but this in no way diminished his influence within the team or the competition. In 1958 he won the Wander Medal as the best and fairest player in the Union, and that same year made his second Carnival appearance at the Centenary edition in Melbourne, while also taking on the role of Penguin’s reserves coach. During his time at Penguin Moore was a regular Union and state representative, his most noteworthy appearance coming in 1960 when he contributed four goals to Tasmania’s sensational seven-point win over Victoria at York Park in the most famous Tasmanian victory of all time. After 70 games with Penguin – including another one-season stint as coach in 1961 – Moore was on the move again, this time just up the coast to Wynyard, again with an appointment as captain-coach. As before, Moore would hold the top job for just one year, and at the end of the following season he returned home to North Hobart where he was appointed captain for 1964. He would play two final seasons for the Redlegs before retiring at the end of 1965 after 102 games for the club. His final total of 202 senior games is impressive in its own right, however the true indication of the esteem in which Moore was held is reflected in his tally of representative guernseys – a total of 53 games for TANFL/NWFU and Tasmania. Despite all the individual success to come Moore’s way during his career there remains one glaring omission on his football CV – a senior premiership. In fact there was a distinct lack of team success wherever Moore went; surprisingly, his 14 seasons of senior football across three clubs resulted in just six finals series and only two grand finals. The closest he would get to the ultimate victory would be North Hobart’s heartbreaking three-point grand final loss to New Town in 1955, while his second appearance in the last game of the year turned out to be his final match – the 1965 TANFL grand final against Glenorchy – a match the Redlegs would lose by 31 points. The lack of premierships takes nothing away from Moore’s legacy however, and when various teams were selecting their ‘Team of the Century’ around the turn of the new millennium, both North Hobart and Penguin considered Moore’s on-field contributions to their football clubs worthy of inclusion in their greatest teams of all time.